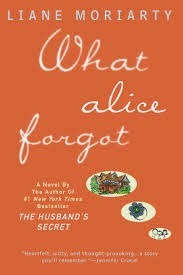 a book chick: "What Alice Forgot"
my take: When Alice, a 39 year old mother of three, falls off her spin bike and knocks her head she forgets the past ten years. She finds her relationships falling apart and that she's dating a new man. The nature of her amnesia is baffling to those around her and to herself- some things she remembers by muscle memory and she's quite surprised by her current life. Interspersed are letters from her surrogate grandmother to a dead lover and her sister's letters to a therapist, allowing the reader to gain knowledge that Alice herself can't access. BFF and I had a good discussion on whether or not the premise that life changes a lot in ten years is plausible. And what kind of events or people could change us. Glad you enjoyed too - for chick lit I this one really actually made me think (plus was fun to read). I spent a lot of time talking to people about this idea of how we change and become people we never might have expected based on all kinds of little and big events. And how weird it is to think that in 10 years from now I might think I'm going to be who I am, but who knows!